Our Ultraman obsessed web guy has posted the first of Tor's Nippon World Con podcasts. I've just started listening but it seems to be Patrick Nielsen Hayden and Tom Doherty giving a quick overview of World Cons in general and what's coming up at this year’s convention. I believe there will be a new podcast each day at noon (NY time), including an interview with George Takei. As someone who spent the week getting, “off to Japan -- wsh you were going” emails all week, I’m looking forward to getting a small taste of the goings-on. I often wish there was more room on our list to bring in more artists that I’ve never worked with before. One problem is the amount of series titles we do. Another issue can be timing – if I'm pressed for time I feel more comfortable working with someone I already have an established relationship with. And then there is simply the fact that the group I am working with is really good and appropriate for much of our list. Still, it is fun to bring in new voices so I was happy that this week saw a convergence of three projects that called for new-to-me artists. Joy Ang (whose work was amazing even when still in school) will be working on a young adult novel for us. Tomer Hanuka (who I’ve admired about for years and am very excited to finally get a chance to work with) has taken on an anthology of mystery/superhero stories. And Sam Weber (who I just discovered from Cathie Bleck’s blog and instantly fell in love with) is starting a contemporary fantasy series with Chinese themes. I'm looking forward to the next bunch of weeks and seeing what these guys come up with. 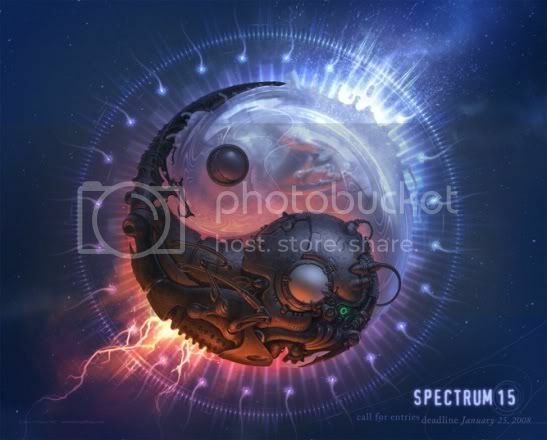 Spectrum is showing off their 15th annual Call for Entries. Artwork by Marc Gabbana. Posters will be mailed out in October. On a more personal note, the Fenners and I have started very (and I mean very) preliminary talks about the second Spectrum Exhibition to be held at the Museum of American Illustration at the Society of Illustrators in September 2009. This exhibit will be a selection of 150-200 original artworks chosen from Spectrums 12 through 15. Preliminary talks basically consist of me saying, "It'll be easier this time, I swear!" over and over and over again. Unfortunately I haven't convinced anyone yet...least of all myself. And yet, somehow it seems exciting all over again. NS: Why should Mainspring be the next book that everyone reads? JL: Because of the incredibly cool cover with the airship and the feral angel! In fact, I think everyone should carry copies of the book with them at all times, faced outward so that we all might know one another by this sign. Also, it would make my publisher happy. I had lunch today with one of my favorite exTorids, Will Smith. (No one ever really leaves the Tor family.) Will has been running an online book store called Hang Fire Books. 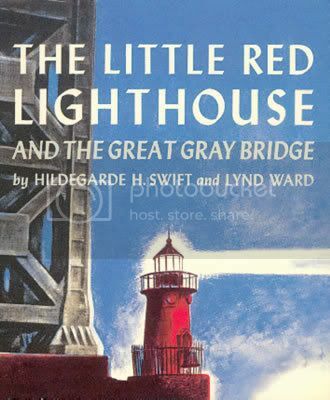 He has also has a huge array of vintage book covers displayed in various Flickr sets. If you are not careful, you can spend much more time than you mean to poking around there. For as many times as I've ridden my bike to the Little Red Lighthouse (and the great gray bridge) I never knew you could climb up it until yesterday. The dirty secret of book design: Almost all books are only seen by their spines. It's true. We spend hours choosing artists, getting pictures painted, working on layouts, going to meetings, debating the merits of each cover and starting all over again, and then...they get shelved and typically all anyone sees is an inch or so of spine. (Unless it's fantasy, in which case that spine will be about three inches, but still...) It's not a lot of room to make a statement but hopefully we can put something together that will encourage a reader to pull a book out and look at the rest of the cover. As a kid I used to like to draw from my brother’s Dungeons and Dragons book, Deities and Demigods, and my mom’s copy of The Larousse Encyclopedia of Mythology. (Which I still have.) 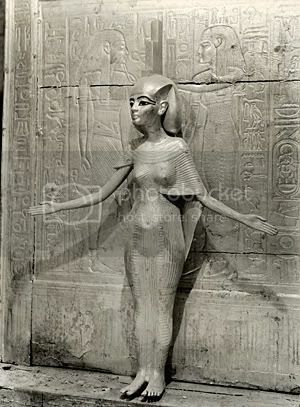 One of my favorite images was this carving of Akhenaten seen in Larousse. I suppose it was because the linear forms were easy to draw, but I also remember enjoying the sun-rays-as-hands. So, how cool was it to run into this very piece of stone at the Franklin Institute’s King Tut exhibit? Pretty freakin’ cool, would be the answer. Sorry, Tut, my strongest memory of this show will be of daddy Akhenaten. Burton cataloged all the items in the tomb and documented the excavation – often using natural sunlight via a system of mirrors throughout the corridors. The photos are just breathtaking. Equal parts science and art, the artifacts are presented simply and without pretension. There is a clarity and calmness to them that will stay with me for a long, long time. I just happened on this exhibit on my way out of some larger show at the Met....Funny, I can't remember what that other show was. As an aside – Tony DiTerllizi, of Spiderwick fame, has a couple of very sweet posts were he shows his boyhood drawings from D&D Monster Manual on his MySpace page. Very cute. It seems it’ll never be sunny in NY again...Even the flowers know it. Tobias Buckell has posted a progression of Todd Lockwood’s painting for Sly Mongoose, the sequel to Crystal Rain and Ragamuffin. 1: Tor has announced podcasting at World Con. 2: Tor now has a Facebook page. I have to admit, although I have a profile there, I am utterly confused by Facebook. It’s raining and cold in New York so...a quiet blue post. Type and copy may tweak a bit but this is basically the cover for the sequel to Jay Lake’s Mainspring. Jon Foster recently sent in this painting for Dragon and Liberator, the final book in Timothy Zahn's Dragonback series. Usually I am somewhat grateful when a series is ending. Series eat up so much of our list and the requirements of them can sometimes be confining. By the time you get through six, eight, twelve books it's nice to move on and have an opportunity to begin something fresh with that artist or have the space to bring in another artist. But I'm sad to see the Dragonback series come to a close. I love working with Jon and I was always particularly excited to see what he would come up with for these books. A boy and his pet tattoo dragon - you really can't beat that. I like all of them but I think Dragon and Herdsman is my favorite. We had an alternate sketch for Dragon and Liberator that was very strong but ultimately we liked how this image made a nice bookend with the first cover. It's a known fact: Sunflowers make the day go faster. 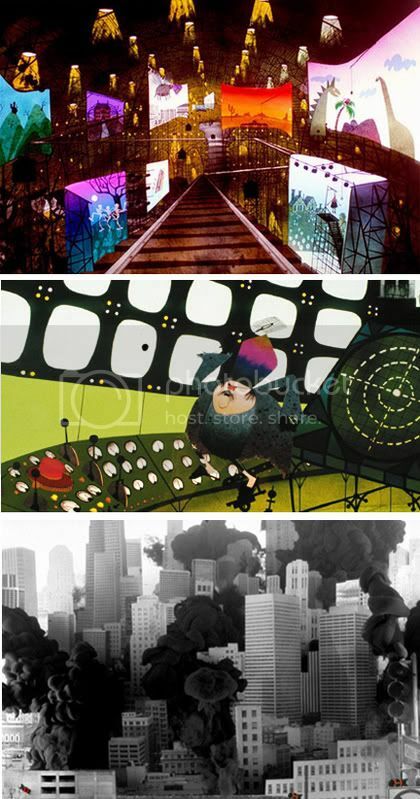 Illustrators Conference 5 has announced their city and dates. Hooray for New York, New York and the fact that I won’t have to travel! For thems that does have to travel, they claim room rates of $180.00 a night. (Although they aren't saying where. Hmmmm.) The website is not up yet but you can check out Icon 4’s website to see the kind of event this will be. 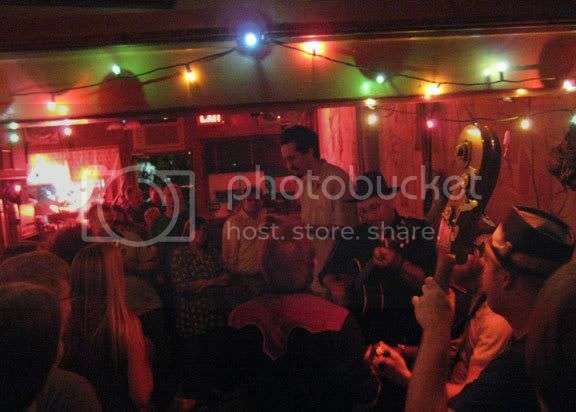 Friday night’s scene at Sunny’s Bar, deep in Red Hook Brooklyn. Brian Slattery did a reading for Spaceman Blues with musical accompaniment. It made me really wish there was an audio book version with music. Photos: Brian reading with the band. The bar. Team Tor: Author Brian Slattery, publicist Leslie Henkel, editor Liz Gorinski, and me. Many people seem (justifiably) enamored with Eric Fortune's The Red Magician. Here is a progression from sketch to finish. In art school they tell you that a painting should slowly evolved from the ground up. Of all the illustrators I know, only Eric and David Bowers actually to paint like that. Eric's patience pays off -- all that layering creates a glow and a subtlety to the surface that is just remarkable. Thumbnail interview with Eric here. Suddenly my office is full of paintings...which doesn’t happen much in these days of jpegs and ftp sites. Tiger and woman: John Jude Palencar for Paul Park’s The Hidden World, the last in his “Princess of Roumania” series. Polar bear: Greg Manchess’ Nanuk. Not a Tor book...just a wee painting on it’s way to the Society of Illustrators’ permanent collection. And, a full page review in this week’s Village Voice. 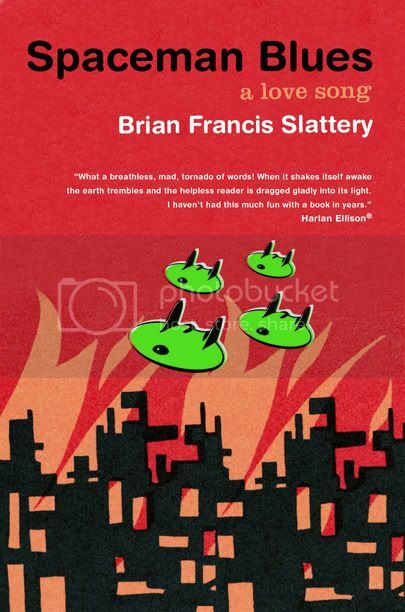 "Slattery should really be considered alongside NYC homeboys like Lethem and Shteyngart, the former for his loving tweaks of vintage pulp...the latter for his sharp immigrant comedy." It’s been a while since I read the book in its manuscript form but it still holds a strong place as one of my favorite books in a long while. You can read the first chapter on Brian's website. August 10th: Release party for Spaceman Blues at Sunny's, Conover Street between Read and Beard, Red Hook, Brooklyn. With music by the Mud Brothers -- Brian Slattery on banjo/jazz violin and John Pinamonti. Party starts at 8:30pm. Bands start at 10pm and go long into the night. Books for sale by Community Bookstore of Park Slope! Potluck, free eats! Free! September 13: Reading at Barbes, 376 9th Street (corner of 6th Avenue), Park Slope, Brooklyn, NY. With musical accompaniment by John Pinamonti on guitar, Charlie Shaw on drums, Rima Fand on violin, and more. Time TBA. Free! Shelley Eshkar, occasional Tor cover designer, is part of an artistic triumvirate called The Open Ended Group. They specialize in interactive digital art installations. While Shell is working on a project based parkour, his partners Paul Kaiser and Mark Downie created Breath -- a series of interwoven banners and light boxes with continuously re-composing music for the annual Mostly Mozart Festival. The work is just lovely. While extremely analytical, both musically and textually, it doesn't sacrifice it’s emotive impact. The festival is focusing on choral music and Breath compliments that by creating an ethereal and contemplative space. Breath is on display until midnight, through August 25. Paul Kaiser speaking at the opening. Shelley Eshkar, making sure no art is appreciated on an empty stomach. Viewing one of the lightboxes. We just had our sales conference today and this cover got the nod from a few reps. I was pleasantly surprised since, 1) it's a reprint of older stories and this particular meeting tends to focus on front list books, and 2) because it's a bit enigmatic and not everyone appreciates that. The artwork is by the legendary Brad Holland -- who also did one of my all time favorite Tor cover paintings, Jonathan Carroll's Outside the Dog Museum. I was away last week so I am the last to mention that the Chelsey Award nominations have come out. (The Chesleys are kinda the SF illustration world’s version of the Nebulas.) 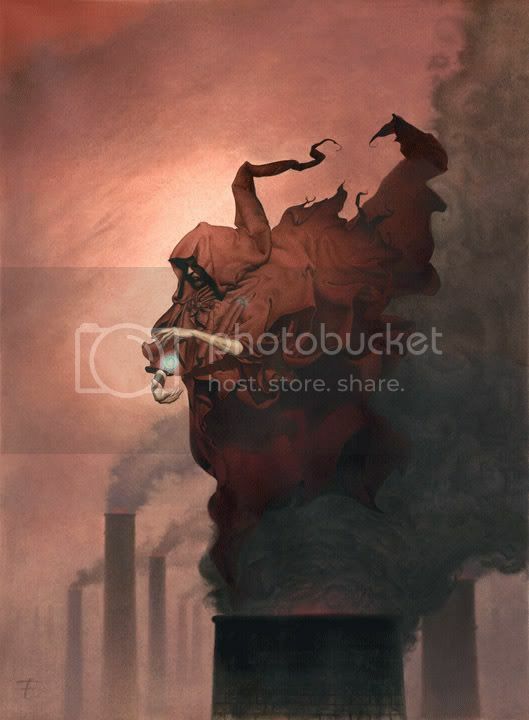 See John Picacio's blog for the list. Yours truly is up for Best Art Director. I’ve been honored (and lucky) to have won this in the past. I must say, the competition is stiff! I’d be as happy to see many of my fellow nominees win as myself. Unfortunately, since the awards are being held in Japan this year, I wont be there. So here is my "cheers" from afar -- good luck to all categories' nominees! We are also female, single, and looking for friends. Hmmm....I wonder if our sign is based on our first publication or simply because it sounds like Tor? I could just walk down the hall and ask but, hey, I’m lazy today. Every time I visit Cartoon Brew I wish I could spend hours and hours tracking down great animation. I particularly love stop motion, or any process that mimics the same quirky movement of stop motion, but rarely give myself the time to explore what’s out there. Twice Upon a Time, a movie that I saw and loved as a kid, suddenly popped into mind the other day. Sadly, it looks as though it has been cleaned up and sanitized since and the version I saw is no longer available. I haven't seen it since I was 13 so I wont swear that the story holds up but a fresh look at these stills makes me believe it’s as great looking as I remember. The animation was done in stop-motion process called Lumage –- a series of cut outs placed on a light table -– creating a fantasticaly textured and, well, luminescent movie. A while back I posted a few animated shorts I love and got some great recommendations from ya’ll. Any others?